Both John Blain and Steve Gilmour have been lucky enough to play in a lot of big games in their cricket careers – and they cannot wait for tomorrow’s mouth-watering CSL Eastern Premiership clash between Mazars Grange and Carlton. The duo fulfil player/coach roles at their respective clubs and both want a victory in Stockbridge for differing reasons. If leaders Grange can emerge victorious, then it would edge them ever closer to the title, while if Carlton can take the points back to Grange Loan, then it would leave them in with a slight chance of finishing top themselves come August 22. 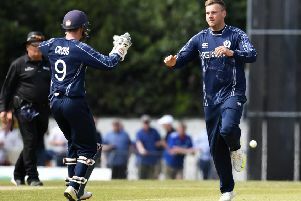 Blain, the 36-year-old Grange bowler who served Scotland with distinction for a number of years, said: “As a player these are the kind of matches you want to be involved in. “Both sides are likely to have their international guys back, both sides have been in good form, all of the players know each other well from the local cricket scene and of course we are playing at what I believe to be the best ground in the country. “So far this season things have been going pretty well for us, but we know that we cannot afford to lose focus at all or Arbroath and Carlton behind us are waiting and ready to pounce. Meanwhile, Gilmour, 33, knows that this is a “must-win” match for his troops. They have ten league wins and three defeats to their name to date in 2015 to sit third, but they have already lost to Grange in the league and the Scottish Cup semi-final. “It has been a good season, we have just lost matches at key times. We know even if we win this match that it will still be tricky to lift the title, but we won’t give up until the last ball is bowled,” he explained. After a long period away with Scotland, George Munsey (Grange) and Preston Mommsen and Ali Evans (Carlton) should be back for this derby. Seamer Omar Ahmad is also set to return for Carlton, although they have slight injury doubts over Gilmour and skipper Gordon Drummond. When the sides met at Grange Loan in the reverse fixture back in June, Mommsen’s 116 not out had looked like giving Carlton a good chance. That was until Munsey played the best club innings of the summer – the left hander smashing 177 not out – to see Grange home by eight wickets. Elsewhere in the top flight, tomorrow Heriot’s host second placed Arbroath at Goldenacre looking to bounce back from last week’s defeat by Watsonians. Watsonians themselves take on Autoecosse Forfarshire at Myreside before facing the same opponents in the semi-final of the national Twenty20 event at Poloc 24 hours later. RH Corstorphine’s relegation would be confirmed if they lose to Aberdeenshire at home.